They’re considered a lifeline to officers in the field, but new numbers reveal all of the RCMP’s Operational Communications Centres across the country are understaffed, in some cases by as much as 50 per cent or more. 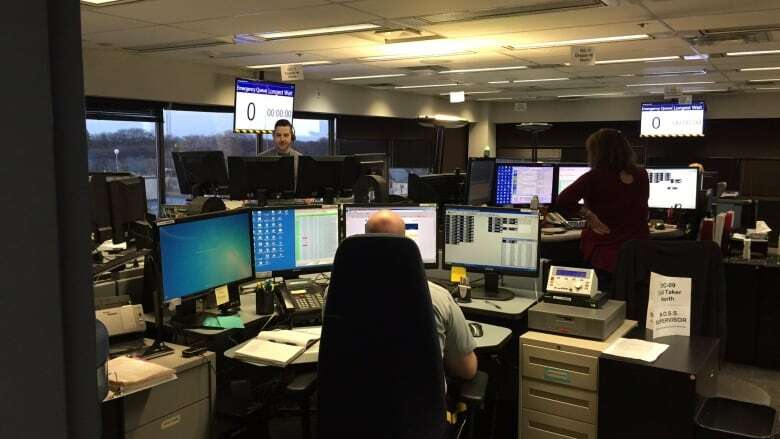 They're considered a lifeline to officers in the field, but new numbers reveal all of the RCMP's Operational Communications Centres across the country are understaffed, in some cases by as much as 50 per cent or more. 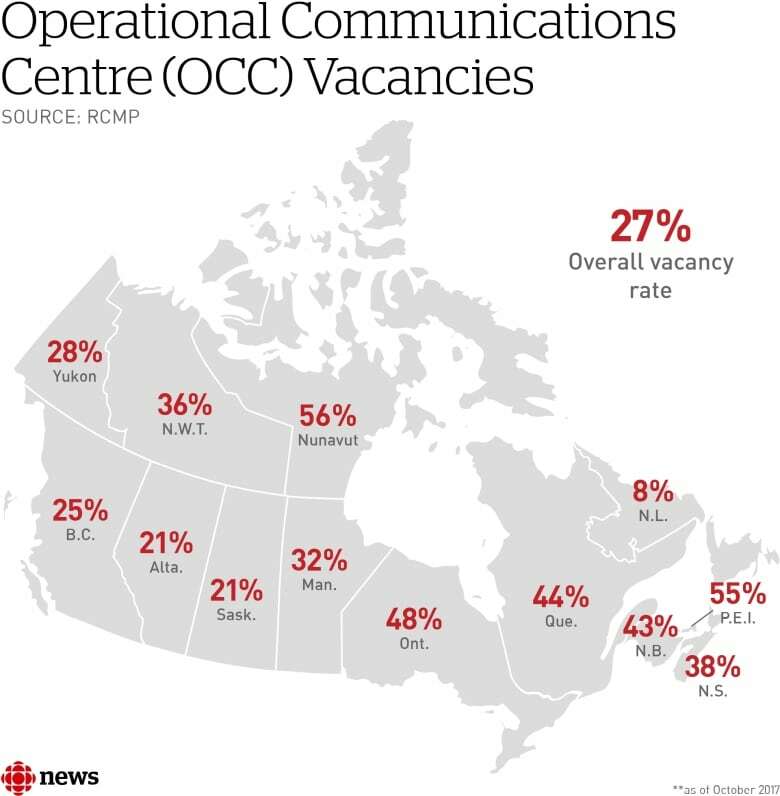 The national vacancy rate in OCCs as of October 2017 sat at a little more than 27 per cent, according numbers released to CBC News under an access-to-information request. The rate was far worse in some parts of the country than in others. V Division, which serves Nunavut, and L Division which serves Prince Edward Island, both had vacancy rates of more than 50 per cent. Quebec, Ontario, and New Brunswick have vacancy rates greater than 40 per cent in their OCCs. "You have people answering the phone that are stressed out of their mind. 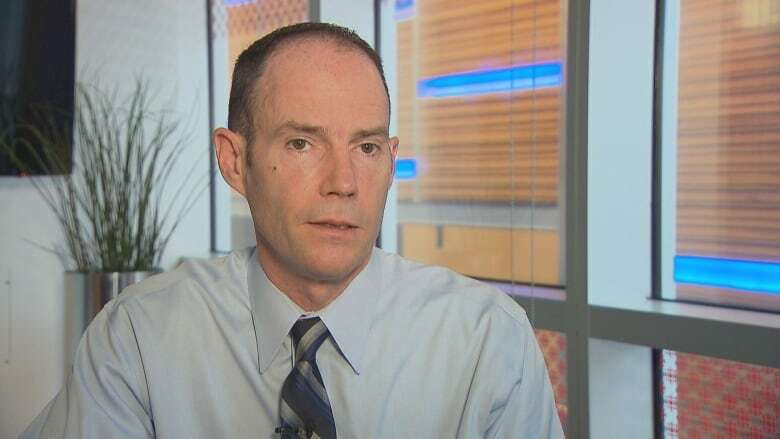 You have some people that are really just running on fumes," one OCC operator told CBC. The operator's identity is being withheld because the worker fears reprisal for speaking out. OCC staff are in the process of unionizing and hope to secure Canadian Union of Public Employees (CUPE) representation in the coming months. OCC operators take 911 calls from the public and perform risk assessments for the officers they dispatch to the scene. They are often tasked with calming the person on the other end of the phone, while they look up addresses, licence plates and other police records to help prepare an officer for any possible danger. In a written response to questions from CBC News, RCMP headquarters didn't specify how appropriate staffing levels are determined, but made clear each division is responsible for recruiting and hiring. The worker who spoke to CBC — a longtime civilian member of the RCMP — said the staffing numbers provided to CBC are outdated and do not reflect current staffing needs for the call volume the service now receives. The worker told CBC that because of increased stress, burnout and sick leave, routinely only half a staff complement will show up for a shift. "On a regular basis, you don't have a minute to catch your breath," the worker said. "These people are answering the phone, or they're dispatching, and it's non-stop. How can you stay at that level of adrenaline for a 12-hour shift? You can't do everything, so something is going to get missed, and I pray to God that nothing happens to anyone." That is a fear shared by every police officer and every telecommunications officer, said Brian Sauvé with the National Police Federation, which hopes to become the union for RCMP officers. "If they miss something, that could result in a member of the public or a member of the RCMP getting hurt," Sauvé said. The RCMP confirms that in the past two years, staff filed 46 "hazardous occurrence" reports — or Form 3414s — related to staffing shortages in the OCCs. It says all reports mentioned high call volume or understaffing. "Basically, it puts in on record that, you know what? You're putting my safety at risk by not having these positions filled," Sauvé said. "And that way, it ultimately has to be investigated, it has to be discussed at a workplace health and safety committee … and come up with some remedial measure." At its national headquarters in Ottawa, the RCMP said its role was to "establish standard national policies and procedures" for its Operational Communication Centres. Each division "is individually responsible for the recruitment and hiring of its telecommunications operators; the reasons for vacancies will therefore vary in each division. Individual divisions also develop their own strategies to deal with vacancy issues," an RCMP spokesperson said in a statement to CBC. In P.E.I., the RCMP said it has recently hired two people to fill vacancies of staff who left their jobs and backfilled the positions of two people who were on leave. At RCMP D Division in Manitoba, a spokesperson said 10 new telecommunications operators are in training. D Division said it also just finished a recruiting process on Jan. 5, resulting in 250 applications that will be processed. In Nunavut, Staff Sergeant Stephen Bergerman said RCMP manage OCC vacancies by backfilling with experienced retired telecommunications operators. He said that at no time has public or officer safety been affected by vacancies. "Historically, it has always been difficult attracting qualified OCC operators to work in an isolated post such as Iqaluit. However, recent recruitment efforts are proving successful, netting eight qualified applicants we will soon be processing," Bergerman said. An internal workplace assessment report for the D Division OCC in Manitoba obtained by CBC sheds light on poor morale among RCMP telecommunications staff in that region. That 2016 report didn't look specifically at the issue of vacancies, but it did reveal 31 per cent of the Manitoba OCC employees felt the workplace culture was toxic and compared it to high school or the movie Mean Girls. It noted that some people referred to sick days — commonly known as "ODS" or "off-duty sick" within the service — to "ODM" or "off-duty mad." And according to workers, one of the reasons they are mad is that former commissioner Bob Paulson announced the civilian members of the OCC would be converted to the public service. That process is still underway, and workers tell CBC it has been a constant source of uncertainty and stress. "We're not going to tell you if you're keeping your benefits, we're not going to give you any assurances that you're being grandfathered in your benefits — things like that. It's disheartening," one OCC employee said. The employee also feared being added to the problem-plagued Phoenix payroll system if moved over to the public service. In November, CUPE filed an injunction in federal court to prevent approximately 750 civilian members of the RCMP civilian employees from being transferred to the Phoenix pay system. They are supposed to be moved over to the troubled payroll system in April. An earlier version of this story said incorrectly that 46 hazardous occurrence reports related to OCC staff shortages were filed in the past year. In fact, they occurred over the past two years.